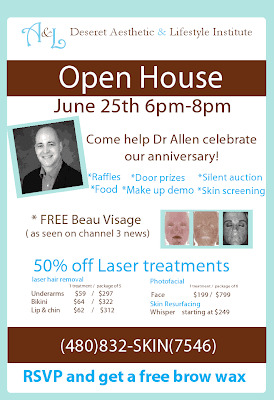 If you are in the East Valley or are willing to drive there come check out Dr. Allen's anniversary party! Him and his staff do an amazing job making us beautiful women look even more beautiful. Their staff is SUPER friendly and totally make you feel comfortable. I am in the process of getting some laser hair removal done for my under arms and bikini area and they have made the process so relaxed. Mind you, it's not the most comfortable thing in the world but they sure try to make it be. I will be there checking out the deals, raffle prizes, silent auction, etc. It's always so nice to have a little summer refresher, isn't it. He is also giving away $10,000 in free services. Come and check it out and tell them that I sent you! I don't get anything for promoting them, I just think they are great people and do a fantastic job. Besides, their office is SO cute. You have to come just to see that!